Srikanth Reddy - SharePoint: Adding Validation to a Custom List Control in Sharepoint ! 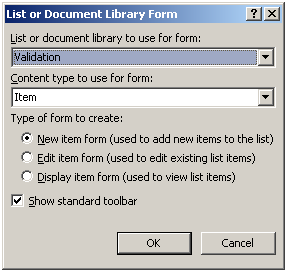 Adding Validation to a Custom List Control in Sharepoint ! 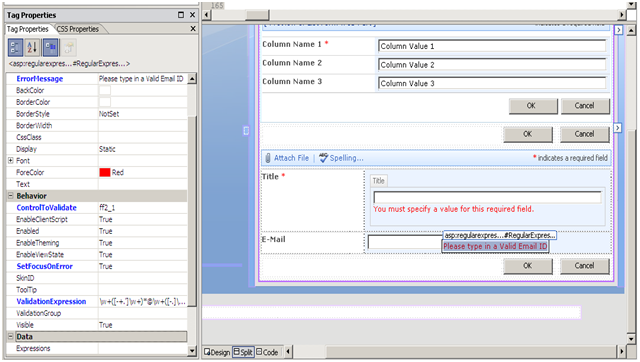 Recently, one of the requirements was to put validation to a custom list control such as Email field validation. 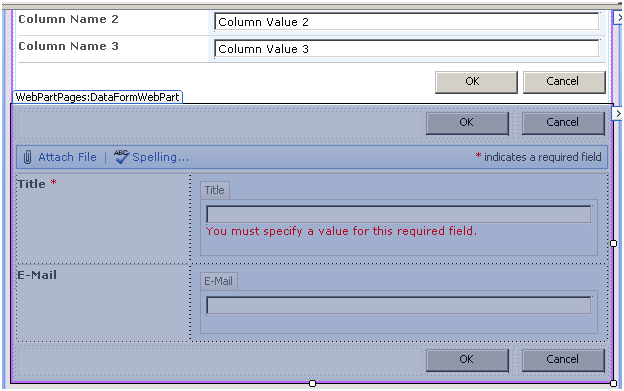 This validation can be achieved from inside the Sharepoint designer. 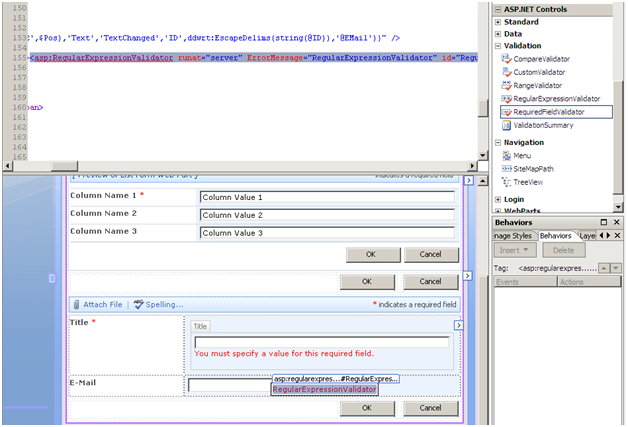 Following is a step by step walkthrough to validate a list field. Following is a list with Email fields. Let's say we have to validate so that only a valid email can be entered. 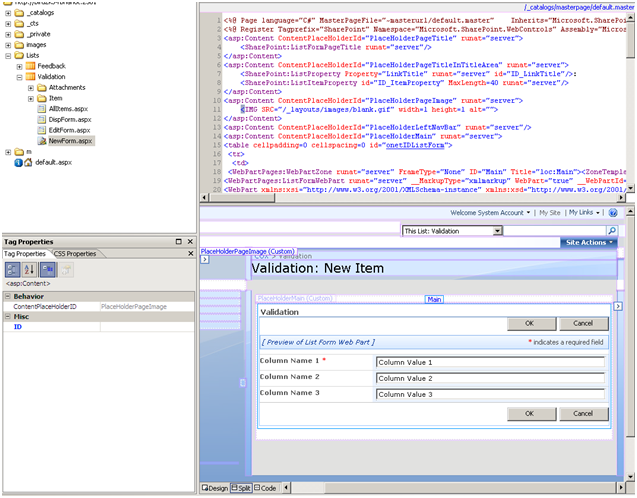 As you can see in the image above, the Newform.aspx of Validation list is being opened in the Sharepoint designer. 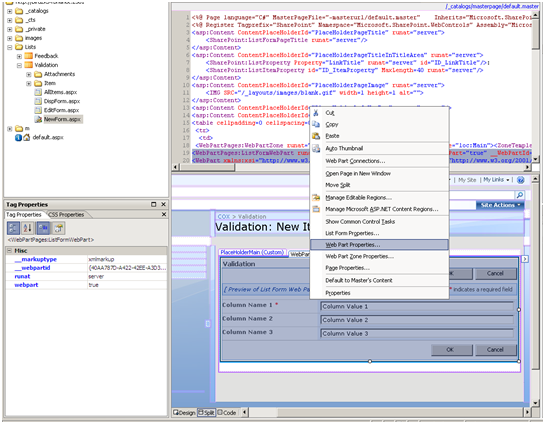 The properties dialog box will open for the Validation list here. 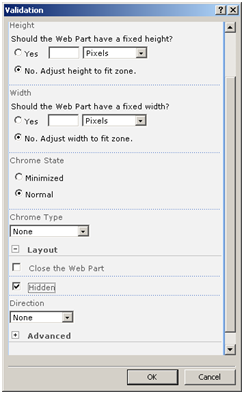 Choose Hidden under layout and say OK.
(This web part can be deleted as well, but due to some known problems because of deletion, it is best to hide this). Now click exactly underneath the hidden list web part and go to Insert->Sharepoint Controls-> Custom List Form… and the Wizard will ask to choose a List or Document Library form based on existing list. Choose your Validation list and select New item form under type of form to create option and hit Ok.
SharePoint Form Validation provides a way to validate input content when you create an item in New-Form or edit an item in Edit Form. By default, SharePoint can do some simple validations such as "Required Field" on server side when you submit form. But you often need validations of various kinds on client side. For example, when you create a task, you would like the form to warn you when your input on "Start Date" column is greater than "End Date" column before the data can be submitted to server. SharePoint Form Validation can help you to achieve it. SharePoint Form Validation can be used on almost all kinds of lists. For most columns in the list, you can add standard validation methods such as "Required", "Compare", "Regular Expression" and "Range" validators etc. After configuration, the form validation will take effect in the New Form or Edit Form page.